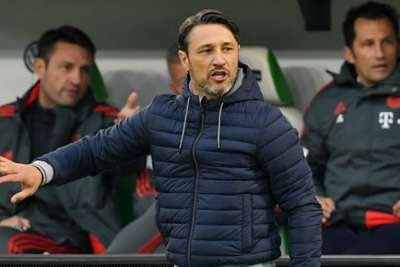 Niko Kovac insists Bayern Munich will not have it all their own way in their Champions League Group E clash against AEK Athens on Tuesday. After a miserable run of form, Bayern got back to winning ways on Saturday with a 3-1 victory over Wolfsburg, easing the pressure that had been mounting on Kovac and the Bundesliga champions. One of those games was the 1-1 draw with Ajax in the Champions League before the international break and Kovac is expecting another tough challenge when his side return to the competition in Greece. Speaking at his pre-match media conference, Kovac said: "I have personally been preparing for two or three weeks for this game. "The task tomorrow is very clear – we want to win the game, but we know that will not be easy. "Victories are always important. For Athens, it could be there last chance [to get enough points to progress from the group] and they will be highly motivated." Kovac will be without Franck Ribery for the game due to a back injury and says a late decision will be made on whether David Alaba will be fit enough to feature after the Austrian was withdrawn at half-time in the win over Wolfsburg. "Franck is unfortunately not available," he added. "With David Alaba, we will decide after training if he is an alternative. Otherwise, everyone is well." After returning to winning ways at the weekend, defender Niklas Sule has urged his team-mates to dig deep and claim maximum points again. "At Bayern Munich you are always in trouble if you don't win four games in a row," he said. "You feel that in training sessions over the past weeks and between the players as well, but we have fought back and rewarded ourselves. "We want to start a new winning series and we want to continue that tomorrow. We have got the right characters for that and I'm trying to do my best."